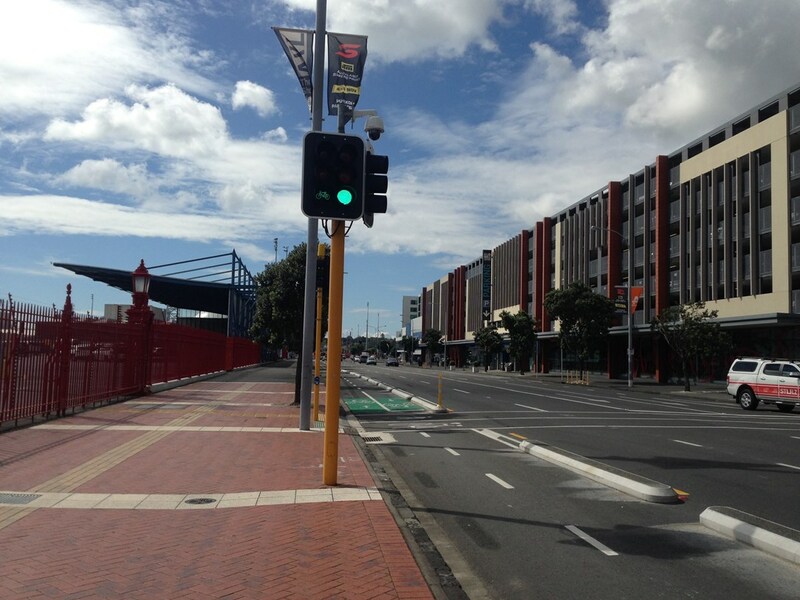 Work finally started this week on extending the popular Quay St cycleway to The Strand. Unfortunately, it’s already had to stop due to protesters. The plan, as it always has been, is to extend the existing Quay cycleway and that will eventually be linked into the proposed new cycleway along Tamaki Dr. That will also provide for connections to the Glen Innes to Tamaki Dr cycleway. All up this will make it an even more important route for people on bikes. The area opposite Spark Arena is also used to park buses off peak and so to accommodate the cycleway, AT plan to narrow the central median in places so that the vehicle lanes can be shifted over. Only that central median currently has Pohutukawa in it. 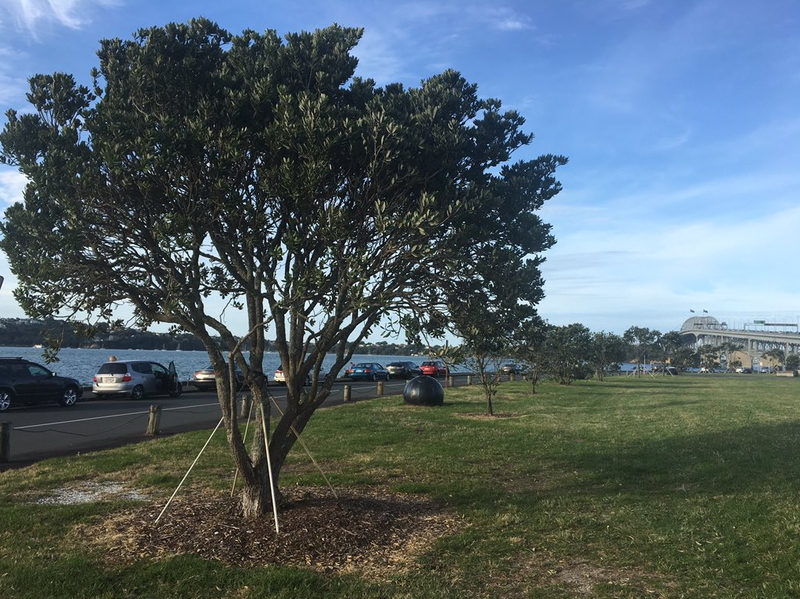 AT gained consent shift the Pohutukawa following a publicly notified process. And shift is an important distinction, unlikely with St Lukes a few years ago, AT aren’t going to cut the trees down but instead move them to nearby Teal Park and other locations within the city centre. 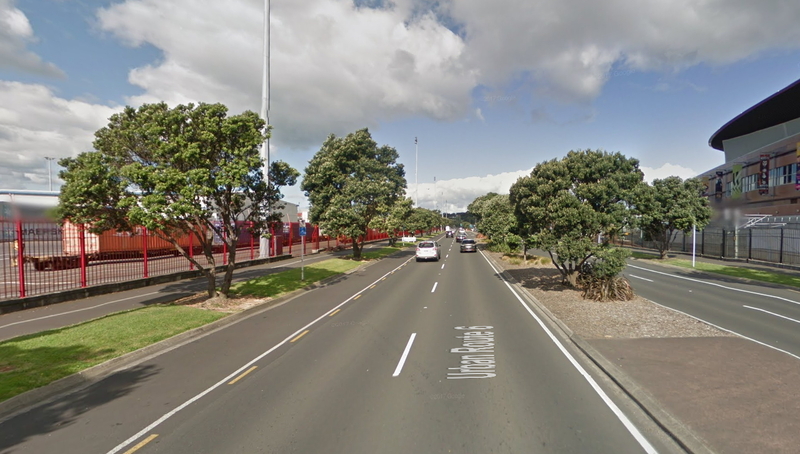 These aren’t even the first trees moved from the Quay St median. A bunch were moved for the first stage of the cycleway to the Harbour Bridge Park. If you go back on Google Street View and have a look, Despite being in the median for decades, they never looked nearly as big or healthy as the images in the tweet below. However, shortly after work started, many of the same people protesting against cycleways at West Lynn have moved in to stop works under the guise of saving the trees. Despite claiming it’s all about saving the trees, it’s notable that we never hear from these same people in other circumstances. For example, what about the strand of 375 Kauri being chopped down as part of the Puhoi to Warkworth motorway, where were they in the discussion about the East-West Link or any number of other roading projects. At least these trees are being moved, not destroyed. At some point it has to be realised that some these people are only really there to stop progress because its a cycleway. It won’t surprise me if we end up seeing them finding a reason to repeat this at other upcoming cycleway projects, such as Ian McKinnon Dr. I think the most valid criticism of the project relates to retaining a large amount of bus parking along Quay St, space that could have instead been used for the cycleway. I have some sympathy for this, especially knowing how AT tend to work in silos and the cycling team were probably told that retaining that parking is a non-negotiable. At the same time, I’m also aware of the need for layover facilities for buses near the city, which can help reduce operational costs. Needing this space is one of the side effects of running a lot of extra buses to provide extra capacity at peak time. I hope that AT are able to resolve this soon. Perhaps one thing that would help would be them promising to plant a significant number of street trees elsewhere in the city centre. They’re something we could always do more of. I originally shared your outright rejection of this group, but they raise a fair point. Are the trees really the least valuable part of te cross section? I would argue that the second eastbound lane is the least valuable. That should go. Being pohutukawa, it would only be a matter of time before they outgrew that location anyway. Pohutukawa need space for their insanely large root system. Bit of a whoopsie there. At the moment, that statement is true as neither is happening. My wife and I cycled past here on Wednesday evening and there was what looked to be a tv interview in the middle of the median strip where the tree used to be. Camera tripod and everything… Seriously though, moving these trees to a better place where they can grow freely and people can use them for shade is a good result – why try and stop that? Pohutukawa make very poor street trees, even when they are medium size. I think they should move them now to a clear area (not next to a footpath in the park either). I remember seeing an article that San Francisco was having problems with some that had been planted too close to footpaths as they were tearing through the pavement. Definitely… along Geary they are (were?) destroying the surface and the drainage and water pipes underneath. Ian McKinnon doesn’t have any pohutukawas I don’t think, just some scrappy things in the reserve that I believe will be replaced with better trees. And will you lay hand on heart that these people will not simply appear with their camping chairs and continue their protests there anyway? If they stop this, they will go on to other locations – because it’s worked for them. They are opposing cycleways, not tree removals – those are just the fig leaf for Lisa Prager and Penny Bright. What I do know is that taking DIRECT ACTION which cannot be ignored – works. Didn’t I get your vote Matthew? Don’t you believe in transparency and accountability when it comes to the spending of public rate$ monies? “Passionate council transparency campaigner and long time thorn in the side of the Auckland Council, Penny Bright knows how to put her money where her mouth is running for mayor. Recently the courts ordered Bright’s house sold for thousands in unpaid Auckland rates – Bright has refused to pay rates until Auckland Council reveals exactly where every cent of ratepayers’ money goes. Do YOU support (‘contractually confidential’) PUBLIC subsidies of PRIVATELY owned, operated and managed Auckland passenger transport providers? When is Greater Auckland going to take up the call for Auckland Transport to be made PUBLIC again? Or, are you just ‘mouthpieces’ for, IMO, CORPORATE-Controlled AT? The only important line is this comment. Auckland Transport plans the network, specifies the routes, sets the service standards, sets the vehicles standards, sets performance requirements, etc. Who cares who actually runs the buses? I don’t think the council should own and operate the buses that they contract to run their network, any more than it should own and operate the paper mill that prints its newsletters. Also it is a little known fact that the “reserve” actually is owned by NZTA, not Auckland Council, and they can be trespassed off it if they cause trouble. They won’t be able to access the rest of it as it’s behind the existing fence and also on NZTA land. There are protesters and protesters. This small group is in the same category as Hobson’s Pledge people, backward, uneducated and clearly with nothing better to do than make like difficult for the progressive population. There are many things to criticise within AT, but when they are finally putting a cycleway where it should be we need to applaud them, so as to encourage them to continue this good work. Give these anti-cyclewayists option two, no more car access along this route (which I personally think long term will be a marvellous thing once light rail is running around the bays). Protest something worth protesting. Nothing except credibility, dignity and self respect. City bus interchange(s) and depot(s) needs a sort out. Buses don’t need to park in this location. I don’t think there is any long term plan. Clearly a large area is required for parking. If it has to be in the central city where land is expensive, why not make use of the Albert St CRL trench? Mmmmh, I don’t see how this is realistic. Even if it was possible to use the in-between layers of the trench for that – maybe – then that would require access ramps and portals. Changes that could easily require some extra million. And space to get back above-ground. Then add costs for ventilation (diesel buses with human drivers!) in there. Then add the fact that the tunnel roof above the trains is designed for buses. Escape routes will be needed in case there’s a fire in between the waiting buses. Then fire ranking for the rail tunnel underneath from a bus fire above. All things that would cost millions and millions, and require much design and lead time. Maybe if someone had liked the idea years ago, sure. Right now, its not feasible, unless you want to delay this cycleway (and possibly the CRL) by several years and add a couple (maybe even a couple dozen) million of cost to it. Lisa Prager and Penny Bright would be laughing – they’d achieved what they wanted. To stop the cycleway. This is the kind of stuff LRT will have a big impact on. The proposed light rail network should include a line out along Quay Street and Tamaki Drive to Saint Heliers. This would be an attractive and popular line for both commuters and tourists along the waterfront and bays. Let’s get the Wynyard to Mt Roskill part built first. Then do the rest. Except even if we build LRT relatively soon, we are in a race with ever-increasing bus numbers, as buses from other directions increase / take over the freed-up space. Bus layover demand will not decrease for ages, if ever, is my feeling, based on previous GA blogs where removing SOME of the bus-mageddon was one of the key reasons LRT performs better than buses in the business cases. Consideration should be made to park the buses up in the area around the old Auckland Railway Station along Te Taou Crescent on Beach Road, which was previously used for buses. This site or The Strand station site could be developed into a new long distance coach terminal for Auckland as well, with the current appalling Intercity coach terminal to be removed from the SkyCity site. I really love the idea of the old railway station being used for intercity buses, especially as it will probably be used for regional rail and is currently used for the Northern Explorer. I sincerely hope that station won’t be used for intercity trains! What a waste. To run all the way from Tauranga and stop 800m short. Use Newmarket station as a terminal for long distance inter-regional services, which is close to the CBD and there are frequent connecting local metro train services and bus services to the CBD and many other parts of Auckland. With some slight reconfiguration of train service patterns through Newmarket with running every second Western line service during the peak periods via the direct link between Parnell and Grafton together with having all services stop at Parnell as an alternative transfer station, and perhaps reopening a Newmarket West platform, this would free up platform space at Newmarket to enable long distance train services to berth at Newmarket. Newmarket would be better than the strand by a country mile. Personally, I’d rather stop at Otahuhu. This would allow an hourly service to Hamilton with four trains instead of the five that would be needed to go to Newmarket. Of course, once the CRL is finished we should go right through to Britomart. Should have been handled via an Outline Plan rather than resource consent – don’t know why AT willingly surrendered their designation over all the roads in the Isthmus and subjugated themselves to the RC process under the AUP. Max… I would say they are controversial due to the excessive consultation and planning rather than they have extensive consultation and planning because they’re controversial. We are a representative democracy, not a direct democracy… consultation undermines this and so is less democractic, simply giving motivated people more say than the rest of us that only impact via the ballot box. I’d love to see Auckland Council cease consulting (the public, anyway) on almost everything and just get doing. If they make a major mistake then you don’t need “consultation” to protest. Yes, I tend to agree with you. The community needs proper democratic input into AT’s direction, not ongoing opportunities to waste a lot of time and get really upset, project after project. Some local consultation is a good idea to raise local considerations AT may have overlooked, but not in the current form. +1, we should consult on a regional cycling plan for three years and then just get on and do it. Local consultation should be on truly local issues only, not whether we want a cycleway or not. Richard, it’s taking AT about three years to put buses on roads that already exist on the North Shore – the roll out of the new Northern network. Here where they have to build huge infrastructure 6 months seems reasonable. Its isn’t “huge infrastructure”. It’s moving a few kerbs, relocating a few trees, and putting down a few concrete dividers. Could probably be done much much faster if one was willing to pay the contractor twice the normal fee to get their A-team on site and schedule it really tight as an operation. My guess remains that that 6 month period is to allow for things like the current nonsense. Why wasn’t it built all the way in the first place? I was biking down here on an Onzo this morning and wondered why there was a guy camping on the median. I should have stopped to chat. Hopefully the cycleway build isn’t delayed much. I respect the right to protest, and i absolutely love trees, but these guys are taking the piss surely? They are an unholy mix of anarchists, frootloops and washed up leftovers of the Workers Communist League. Most of them have nothing better to do, or are “useful idiots” for the political agenda. So they protest cycleways? Ermagerd the stupid is over whelming. My communist great grandfather would be rolling in his grave at the thought that protesting cycleways is the best way to rouse the proletariat. If anything cycleways will help the oppressed access the city under their own steam, rather than being beholden to the global oil companies. Idiots. I think most anarchists, communists and frootloops would be distancing themselves from these ne’er do wells. Come to think of it, most ne’er do wells would be also. People protesting cycleways in a city? Wow. The consent process has occurred, they’ve had their protest, the trees are being put in more healthy locations, bring the police in and move them on. Cue the verbal abuse and physical aggression they will display when that happens. +1. I think it’s police time. The useful debate above shows me enough to see that these trees are not the best suited here anyway. I wish these protesters would get out of their cars more and take a walk along our streets. I can’t navigate our broken footpaths safely because people plant trees with extensive root networks. Next time you plant a tree, try to take into account how much space the mature tree will need in 30 years time. And, you know, plant accordingly? Agreed. 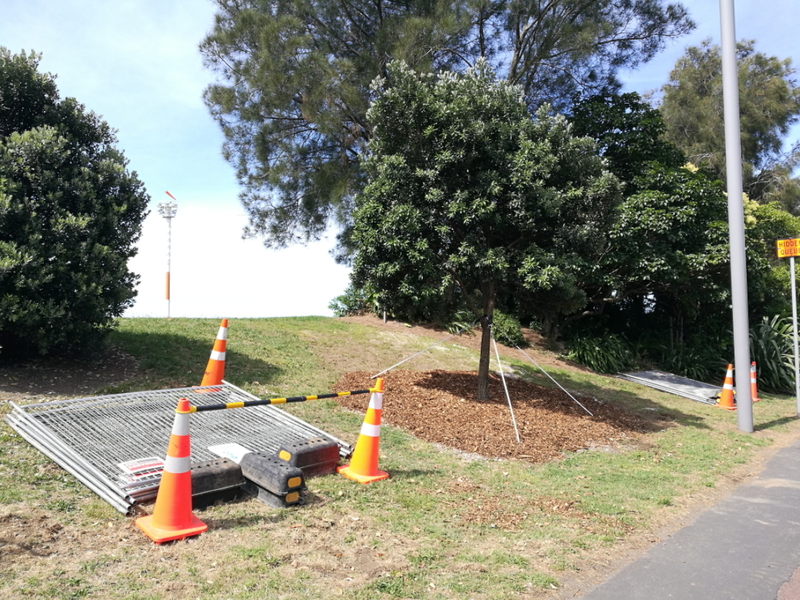 Auckland Council need to carry out a serious rethink of their street tree planting policy. Over the years, they and their predecessor councils have planted predominantly native trees like Pohotukawa and Totara along streets which are completely unsuitable with growing into massive trees blocking out street lights, restricting pedestrian access along the footpath or cyclists and large vehicles passing along the roadway, and root systems which break up the curb and footpath and get into the storm water and sewerage pipes, blocking and breaking them up. Even more dumb is where trees get planted under power lines, which then get hacked and butchered back (in a futile effort) to keep the branches clear of the wires. It feels like when considering trees, AT are like children with eyes bigger than their stomachs. They know the size of tree that would look good across the city, but are unwilling to give the space required. Since people here think public land is the appropriate place for big trees, and this area – like most – doesn’t have a park, the appropriate place for the big trees is indeed beside the road. Yes, they need to rethink the types of trees. But we still need them big. So more space needs to be allocated. Designs are literally showing trees just popping out of the existing footpath where there is no room for any tree, let alone the big tree the location requires. Looking at google earth we could easily have three times more trees on the berm by planting them as a continuous canopy instead of individual trees. Trees please, AT, Council and property owners. The trees being moved in mid-summer was the issue. It’s completely the wrong time to transplant anything, let alone mature trees. The arborist report said it is the wrong time to transplant too. Also, the trees are being moved to provide parking for privately owned buses. Those buses were parked on private property before, which I gather privately owned Auckland Transport recently sold. So they profit selling their own parking. Then AT get paid to move trees which will probably die in mid-summer. Then they get free parking with roadworks they are paid to create. This is a bus layover-/readieness area, which has been there for quite a while. Complaining about that, you might as well complain about “private” buses using public bus stops! Auckland Transport is not privately owned either. They are owned by Council, i.e. by us. There is no “profiting”, and you aren’t exactly explaining what area you are even talking about. The only semi-argument you have is the transplant time, and I’d bet you that if the relocation had been in three months or four months, Lisa Prager would be there just the same. She hates cycleways with a passion. As it is, AT has to care for the trees for three years and replace any that die – as several arborists have noted, it’s the level of care during the transplanting and afterwards that is crucial.